R. Williamson & Associates Announces Partnership with Hunter Industrial Fans. Hunter Industrial, the industrial division of Hunter Fan Company, has become the exclusive high-volume, low-speed (HVLS) fan partner for Chicago-based fan distributor R. Williamson & Associates. Hunter Industrial’s Titan, ECO and XP series fans are now available for purchase through the company. Hunter Industrial Fans was launched in 2016 with its debut product, the Titan series HVLS fan. 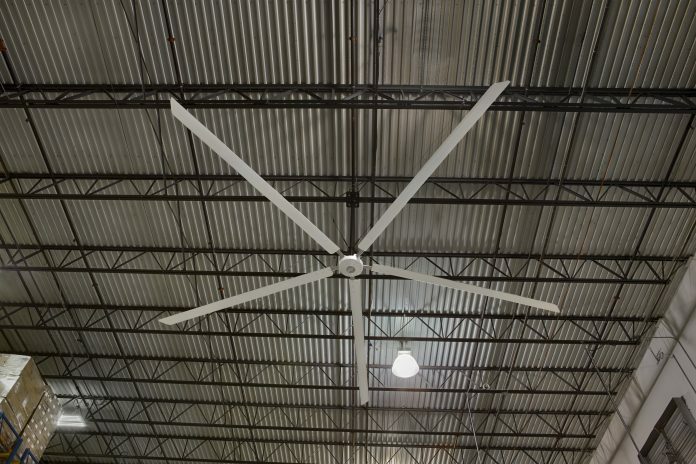 With blade spans ranging from 14 feet to 24 feet, this HVLS fan offers a competitive edge when it comes to efficiency (consuming 50 percent less energy than other HVLS manufacturers), installation cost, weight and maintenance. Using less energy, the Titan efficiently delivers equal or better output than the competition. The company’s second product, the ECO series fan, is among the most lightweight and economical industrial fans on the market. The ECO fans range in diameter from 8 feet to 24 feet. The XP series fan is the company’s newest fan and is engineered to deliver year-round HVAC cost savings and the easiest installation features on the market to date. This new HVLS solution delivers a highly efficient performance with a featherweight design and includes a uniquely streamlined plug-n-play, pre-assembled installation process that does not require any guy wires. Hunter Industrial’s Titan and ECO fans offer a full range of control options, including a standard 1:1 analog control and touchscreen controls that can control up to 30 fans. The XP series fan is equipped with a standard 1:1 analog control. “We are excited to partner with the biggest name in the ceiling fan industry and are confident that through this partnership we can establish Hunter as the same household name in the industrial marketplace. We look forward to a long and prosperous relationship that promises significant growth for both our companies and our customers,” said Scott Williamson, CEO of R. Williamson & Associates. R. Williamson & Associates opened its doors in 1882 in Chicago, Ill. For more than 125 years, the company has supplied the industry with high-quality commercial and industrial air moving equipment. Whether companies need to clean up, cool off, exhaust or pressurize their buildings or processes, R. Williamson & Associates provides the largest selection of air moving equipment available––including industrial fans, commercial fans, general ventilation fans, process fans, exhaust fans, intake fans, ceiling fans, OEM and engineered systems. The company offers a complete selection of make-up air equipment, air curtain systems, air cleaning equipment, industrial heating equipment, distribution and process ductwork and filters. To learn more about R. Williamson & Associates and Hunter Industrial, visit www.wesellfans.com and www.hunterfan.com/industrial. If a company is interested in becoming a distributor for Hunter Industrial, please contact Hunter Industrial’s Vice President of Sales Mark D’Agostino at mdagostino@hunterfan.com.